It is with a heavy heart that I’ve had to cancel the next Oh Dear Diary show, planned for 7th October at the Old Joint Stock. If you have already bought tickets: sorry. Old Joint Stock will be in touch very soon to refund you. As we often joke, it’s easy to find people to come and watch Oh Dear Diary, but not so easy to find people to read. Despite numerous call-outs over the last four months, we just haven’t found enough people with teenage diaries to share with us at the OJS theatre in October. To put on a good show, we need at least six people… this time, we were only able to confirm two. I’m really sorry to those who will be disappointed by the cancellation – not least the guys at the Old Joint Stock box office and Birmingham Comedy Festival, who work hard and could very much do without a festival show pulling out. I feel terrible for letting people down. 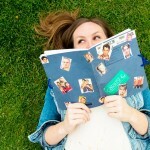 If you have a teenage diary that you’d like to share at a future date, do get in touch anyway. 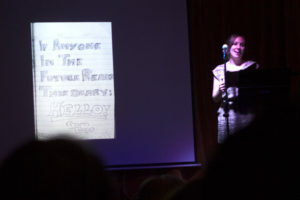 I am very keen to keep Oh Dear Diary going and would love to plan another event for next year. If we can find enough willing volunteers! …Actually, it’s always that time of year. Because we are ALWAYS looking for new people to read at Oh Dear Diary! 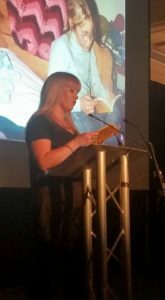 We’re currently planning the next live diary reading event, which will be at the Old Joint Stock in Birmingham city centre in October. If you’ve ever thought about taking part, now’s the time to tell us! We’re looking for people who kept a diary between the ages of 12 and 20 (and still have it, of course). Wouldya, couldya think about reading some extracts from it to our friendly audience? No need to commit just yet – but please email Emma to register your interest and tell us more. How old were you when you wrote your diary? 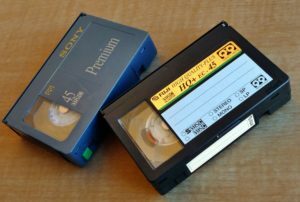 What year(s) does it cover? Thanks to everyone who came along to Oh Dear Diary at Flatpack on Friday. We were astonished to see over a hundred people packing the 80-seater Gas Hall venue on the night! We also saw the wonderful Republic and heard from the Directors, Olie and Neil. Massive thanks to them for being there to introduce it (and sorry I gabbled at you when you introduced yourselves – I was surprised!) I’ve since found that some of the audience were originally from Blyth and had travelled from wherever-they-live-now especially to see it too! Worth the trip – a very funny and poignant film. You can view the Republic trailer on Vimeo here. Special thanks must go to the Flatpack Festival organisers, especially Selina, for recommending ODD as a Flatpack event; Lucile and Sam who “got” ODD straight away, came up with the format for the evening and chose the perfect film to go with it; Mark for making sure we would have everything we needed tech-wise; and Stuart for his calming influence on the night, running the slideshows, getting the mic and light levels right and showing the film. There was also a team of amazing Flatpack people there on the night running front-of-house, getting extra chairs in, making sure we were aware of timings, directing people, etc etc. I’m embarrassed to say I’ve forgotten the name of the main person, thanks to my terrible nerves on the night, but I think she was called Holly. This was the first show where I haven’t had to worry about any of the venue logistics, so thank you especially for that. Want to read at the next Oh Dear Diary? We’re looking for people who kept a diary between the ages of 12 and 20 – and still have it! – to read at the next Oh Dear Diary show in October. If you think you’d be up for it, email emma@ohdeardiary.com and let me know. Include a bit of info about the type of diary you have – the age you were when you wrote it, whether it’s a long form diary or a line-a-day, the sorts of topics you covered, why you think it’s funny now, etc. I’ll be in touch! 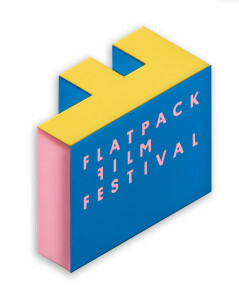 In case you missed it, the next Oh Dear Diary show will be part of the Flatpack Film Festival in Birmingham at the end of April. So we’re mixing it up a bit this time. As well as some stonking diary readings, from brave volunteers – most of whom have never shared their teenage diaries with anyone before! – we’ll be screening a short film: Republic (2013; 42 mins). We’ve only seen the trailer but we think you’ll agree it would seem to be very much up the Oh Dear Diary alley. Do come along on 22nd April and enjoy the whole thing with us! Yes, we’re back in our comfort zone for another round of awkward cringeworthy diary readings. It’s Oh Dear Diary time again! After the previous two Birmingham Oh Dear Diary events sold out, we decided we’d better move to a bigger venue. So we’re delighted to tell you that the next Oh Dear Diary will be at the Old Joint Stock Theatre, which is on Temple Row West (by the cathedral) in town. We also had some feedback from people saying they wanted to be able to stay out later, so this time it’s on a Saturday! Woohoo! Tickets are £7.50 and you can book over the phone (no booking fee) from the Old Joint Stock box office on 0121 200 0946, or online via the Old Joint Stock website.